xileffilex 1 day, 3 hours ago. It’s a psy-op/drill favorite, the bus crash. While looking at one with very dodgy looking imagery, involving pupils from a top private school in Brentwood, Essex, UK, I noticed that one law firm was dealing with the cases of several more such incidents. A swift and thorough investigation must be held into a bus crash in France in which eight pupils and a teacher from Dalbeattie High School in Dumfries and Galloway were injured, according to specialist lawyers acting for victims hurt in similar incidents. What else is in their case load one wonders? Specialist lawyers at Irwin Mitchell represent victims of coach and bus crashes in the UK and abroad, notably acting for passengers injured when a coach crashed on the way from La Rosière to Chambéry Airport in France in January this year. The team also represent children from Brentwood School in Essex injured in a crash in Belgium earlier this year, as well as 25 passengers injured when a coach returning to a school in Alvechurch, West Midlands crashed in the northern France in 2012.
source – source We now have a full scale drill. Le Chambery video and images.. Unusual accident damage. The glazing bars and body panelling to the damaged(?) off-side are all intact. Greatly limiting internal damage. And yet the passenger seats appear wrenched from their floor fixings. In practice would that happen? A truly lazy bus-crash-hoaxer would just photoshop this “damage”. I’m guessing there are crash perverts who actually do this for a living? In the course of their business accumulating vast libraries of bus images to work with? Digitally adding superficial damage to those library images, and letting our imaginations do the rest? Explaining perhaps why the “damaged” side of the coach is so conspicuously hidden from view? Always easier to hide it, than get yourself rumbled for shoddy photoshop work? What little damage we can actually see looks very contrived and insignificant. Those wonky seat angles even looking ‘shopped. Creating that all-important crunched-up interior, to explain all those “serious injuries”. That damaged overhead luggage rack appears digitally “adjusted”, too. And then a dirty mud-spatter effect applied. Or even real mud patted-on? While the coach is in for routine work? To replace a chipped windscreen perhaps? Taking the opportunity to ease off the front grille, the off-side wing mirror and the wiper-arm. Generally making it look very dishevelled. Kerr-ching, indeed, Felix! The underside shots probably come from library images. Obtained while that model of coach is on the garage ramp, or over a service-pit. There being very few coach makers and models that the task of collecting underside images is never too onerous. And bus and coach operators, being highly-regulated and deriving most of their revenues from public sector contracts and subsidies, will always be ones to play ball. Last week saw a dramatic crash of an Ulsterbus; the company being part of publicly-owned Translink Corp of Northern Ireland. The bus apparently crashed through the sea wall, and ended up on the shores of Strangford Lough, near Newtownards, Co Down. Difficult to see how it even cleared the sea wall? Nor how it managed to stay upright and land on its wheels? Never mind how far it got out into the lough. Its distance into the lough seems to vary from photo to photo. Dragged back and forth by the tide? In later images in the sequence, the bus has somehow wiggled itself backwards. Much nearer to the shore, and now running parallel with the wall. Greatly assisting in its recovery..
Notice also how the wall height keeps changing, as does the bus’s position in relation to the sea wall. At last safely back on dry land. What a to-do! The “responder community” were brilliant, as ever. 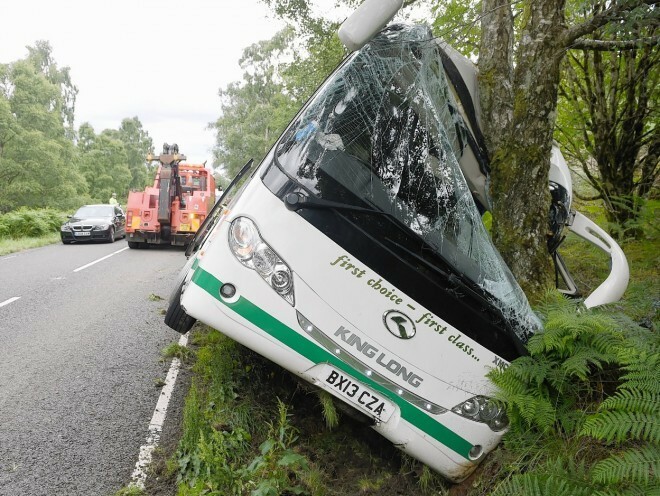 A Police Scotland spokesman said: ‘Around 2.10pm, a coach with tourists overturned on the A83 Rest and Be Thankful. ‘It is understood that 32 people were on board of which five are believed to be seriously injured. ‘They are being taken by ambulance/medivac to either the Southern or the RAH in Paisley for treatment. Twenty five people are described as ‘walking wounded’. same old hoax, same old golden capes.same old isolated location. Great place to stage it. Wonderful scenic background. And on one of the remotest stretches of Britain’s roads. Conveniently. Not a house for miles. With the A83 sealed both ends, not a soul to bear witness, except for the drill perps themselves. The “damage” to the coach is curious. Supposedly it suffered a 360 degree roll as it tumbled towards the loch shore. But as others have remarked, it’s astonishing how little damage there is. Incredible, how its glass-fibre roof stood up to the trauma. Not crushed flat, nor even cracked or dented. From this photo, it looks like the coach was perhaps gingerly rolled towards the loch, starting from the parking layby. But from other photo angles, even staging it that way looks precarious. Would you really want to risk it? Perhaps it’s easier, certainly safer, just to ‘shop the coach into position, alongside Loch Restil? On that point, it’s curious how most of the crash images show a brilliant white coach. Whereas the company’s traditional livery is cream, not white. While older photos of the same vehicle sometimes show it in cream; sometimes in white. Maybe just a trick of the light? Or something else? Same coach but now cream? Back to being a white coach? Whatever the answer, it’s certainly easier to ‘shop the “damage” onto a white vehicle than it is with a cream one. And didn’t they do well, what with those grass tufts, the dented panel with warped livery, “broken” windows, loose front grille, and, of course, those curtains flapping loose. The coach itself (BT14 DLY) is one of five identical tri-axled Volvo B13RT with Jonckheere bodies; all new additions to the company fleet in June 2014. Complementing a further eight Volvo B13RT, again with identical Jonckheere bodies, acquired just months earlier.. But to the untrained eye, all that distinguishes these thirteen(?) 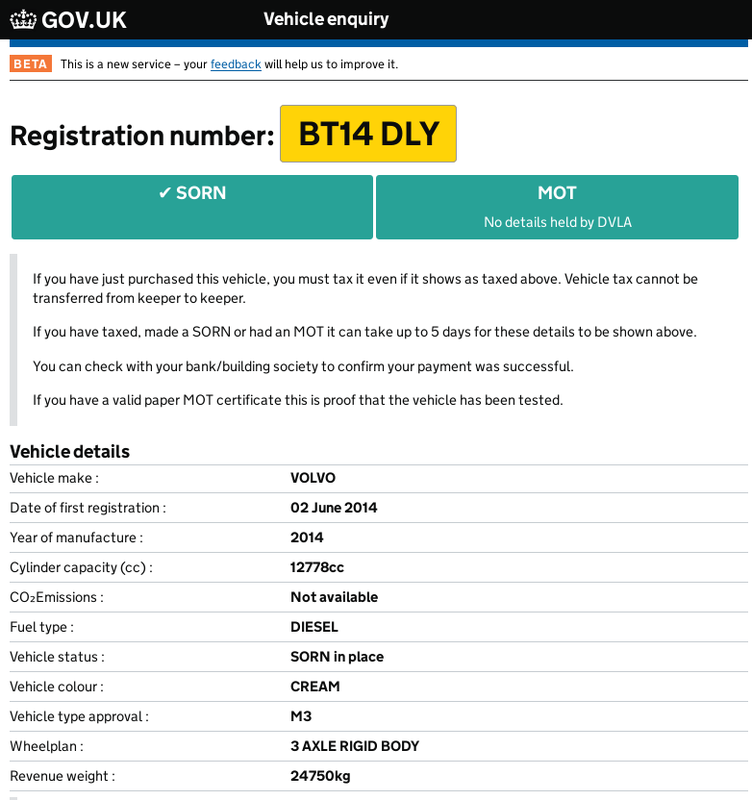 new Volvo coaches, at least externally, are their plate numbers, and their familiar names (e.g. “Glen Garry”) stencilled onto a small removable panel above their front wheels. Introducing the possibility for confusion on a Titanic/Olympic/Britannic scale? As if that would have any bearing on anything. Conclusion – no passengers. Donald Clark, owner of The George Hotel in Inveraray, said: ‘I had friends coming up an hour before the accident happened and they said it was very blustery. Allegedly shunted from behind, but the damage at the front is much more severe.Note the carefully photographed suitcases, as with most aero psy-ops, to create the impression of a tour in progress. I guess the “names” will always cough up for these drills. isolated area in London, multi agency response, the air ambulance, the usual drill trimmings. Are there any real bus and coach crashes? Yes, I saw that. Again illustrating how the employees within the holiday travel group could all be kept in the dark. Ensure the staff at each of the seven hotels is compartmentalised. Isolated from the group’s other hotel sites. Leaving the staff at each hotel presuming the injured guests must be staying elsewhere. Keeping the whole thing under wraps. Allegedly shunted from behind, but the damage at the front is much more severe. Note the carefully photographed suitcases, as with most aero psy-ops, to create the impression of a tour in progress. Yeah, and in personal injury claims on “long-tail” policies, they won’t be immediate settlements. It could be years later before the underwriting Names actually get “sheered like sheep”. Better still if those future liabilities – arising from the coach crash psyop – are collateralised further and shifted to other syndicates or external re-insurers, in what they appropriately call a “run-off”. The fauxtography in that Swiss coach crash is especially dodgy. Presumably the coach is supposed to look like it’s been jacked-up and on rollers? But why would they need to do that? In the faux-to, the coach is just too high at the front-end, and too far towards the kerb. And the way the nearside front pillar has been severed in two places isn’t plausible. It’s a very important structural component, and surely wouldn’t fail like that. It looks cut rather than broken through impact trauma. And shouldn’t there be concertina damage from where the (missing) nearside door would have impacted the body panel to its right? Even the traffic cone looks pasted-in. Hmm. Not persuaded. Glad I’m not a Name! Good one, I wonder if Mr Psaradakis was at the wheel? Next, try it as a HRDPAR. [always suspicious, check the staged photo complete with posing emergency personnel with hovering helicopter…] has been compared with the worst ever in 1982, a decade of staged transport disasters. It occurred on July 31, 1982 on the A6 motorway near Beaune, Côte-d’Or. The most deadly road accident in France, it left 53 dead including 44 children and adolescents aged 5 to 17 years. Most of the victims were on a bus that caught fire as a result of the accident and were from the commune of Crépy-en-Valois in Oise. Shortly after, around 1:45 am, during a slowdown in the “funnel” of Beaune, a dangerous area where the highway passes from three to two lanes, two cars in the 3rd row fall precipitously between the two cars. The leading coach must suddenly slow down because he is bothered by a German coach in front of him. The second car hit the second car that fell, causing a pileup. The tank of the car splits and empties on the road before the gasoline ignites. Six vehicles catch fire. Then there was a pile up at 1.45 am, allegedly involving several cars and a leading German bus. The first coach is evacuated by drivers and instructors. In the second, a side exit is blocked by a car. Two monitors still managed to get about fifteen children out of the back door of the vehicle but 44 remained stuck inside with the two drivers and two monitors. Five other people including two children die in both cars (there were no survivors in the two cars involved). Families are informed of the accident at 6 am The name of the dead children is communicated by the mayor of Crépy-en-Valois around 11 am, in alphabetical order. Few bodies are identified. The funeral took place in the same town on August 3, 1982 in the presence of President François Mitterrand. The bodies of the victims could not be identified, they are buried together under a large stele in the cemetery of Crépy-en-Valois. Following the trial, the carrier was sentenced to 18 months in prison suspended and 25,000 francs in fine: the vehicle had indeed a seriously defective braking system. One of the drivers is sentenced to six months suspended imprisonment, one year of license suspension and a fine of 2,300 francs. The insurance company must pay 12 million francs to the families of the victims. A memorial was erected in 1985 on the rest area of ? ?Curney, in the immediate vicinity of the place of the accident (commune of Merceuil) 2. The children victims of this accident rest at the cemetery of Crépy-en-Valois; on the plates we can read the names of the children, some of whom come from large families. s the National Federation of Collective Accident Victims. Every year for more than thirty years, on the anniversary date, the City of Crépy-en-Valois commemorates the accident at the Hazemont cemetery in Crépy-en-Valois where the victims are buried. Hmmmm, we seem to be on familiar ground here. Here’s contemporary TV news coverage, let’s see if there is any evidence of staging..
Any steering of legislation following the “crash”? Naturellement…. The then Minister of Transport, Charles Fiterman, decides to take strict measures. The maximum authorized speed for coaches is reduced, the speed in rainy weather for all vehicles is reduced to 110 km / h on the motorway and 80 km / h on the road. Public transport of children is forbidden during crossover periods in late July and early August. All heavy vehicles (trucks and coaches …) must now be equipped with a speed limitation device, on which any modifications by its user is strictly prohibited8. In addition, public transport vehicle manufacturers must use noncombustible2 and non-toxic materials and install laminated glass windshields. Straight over to Southern Germany for the latest staged bus crash with a heartstring tugging 48 children [not] injured..
note image 11 shot through a potato lens so we can’t see how little damage there is. Also, rows of do-nothing drill ambulances. A complex scene, with our brave firefighters underpinning an undamaged building which the bus didn’t crash into. Not a child in sight, but there is some fake blood smeared around. Three helicopters, too, allegedly. i.e. the vehicles were prepped for the photo-shoot. “All 44 who were on the bus injured, among them 7 adults and 39 children”. Can those guys not count?? – do buses not have airbags for the driver? Photos of the place of accident show a heavily damaged wall. Why crank this up? Because the lawyers want a drink from the hoax fountain. Mr [Ireneusz] Luszczewski, known as Irek, was hit in the face by debris and the top half of his left ear was sliced off. Those on the top floor helped patch up the injured with makeshift bandages while firefighters and paramedics led stunned passengers to safety. The impact – described as ‘like a bomb going off’ ** – left a large branch in the road, near to Russell Square tube station, along with debris and shattered windows from the bus. Sharna Martin, 22, who works nearby, told how she found a man collapsed on the top deck with half of his ear ‘hanging off’ while his young son looked on. Ms Martin, who administered First Aid with a colleague, said: ‘My two colleagues were just in the shop next door buying their lunch and they called 999. Philip Banks, the lawyer heading up the case, said they are looking for compensation to cover future medical bills and rehabilitation, and damages “to help him recover both physically and mentally from this ordeal”. a nice little one-two with the insurers. The chief executive of Golden Tours Ltd, Nick Palan, referred questions about the crash to the company’s insurers, who are handling the case. The insurance broker declined to comment. OK, so bringing the hoax up to date, it came to pass that the bus driver took his hands off the wheel to look at a map. Suuuure he did…. He is now in line for thousands of pounds in damages from the bus owners, Golden Tours Ltd, after the sightseeing firm admitted 95 per cent liability for the crash. Where’s the “half torn-off ear”? could be anybody’s ear. could be great theatrical make-up. "@Lee_Gaskin1: Adelaide ice hockey team bus crash on way to Canberra pic.twitter.com/8wbUHQSPGI" Thank GOD the crime scene tape's in place! no, of course not, that’s Australia in 2014. The Humboldt Broncos team, which has members aged between 16 and 21, were en route to a play-off game when their bus collided with a lorry on a rural road. Trudeau’s tweet at 3.33 AM GMT/UTC. The lorry and bus collided on Friday at around 17:00 local time (23:00 GMT) on Highway 35, north of Tisdale in the province of Saskatchewan. The Royal Canadian Mounted Police said 28 people including the driver were on the bus at the time, and that fourteen people were killed. Fourteen people who were aboard the bus have been taken to hospital. Three are in critical condition. No doubt declared dead at the scene. Seems like a very high death rate. This single image has been well circulated – sure, invite the cameras in, push those beds close together please nurse. Pose! Snap! Fast work, the ‘crash’ only happened 2.5 hours ago. Gotta get the story out there quick. The bus carrying the Humboldt Broncos has been involved in a serious crash with an 18-wheeler enroute to their game against the Nipawin Hawks. Damn is it time to mourn again already? DaveJ is right. These hoaxers are spiritual murderers. On a side note, Saskatchewan roads, including the TransCanada highway, can be in awful shape. When we traveled on it a few years back, one of the lanes was practically gravel, and of course my windshield was hit by a rock. Nicely staged suitcase in front of the headlights. No way it can physically end up there, typical stage prop. Former Swift Current Bronco Bob Wilkie, who was involved in the 1986 fatal bus crash, joined former teammates Sheldon Kennedy and Peter Soberlak as they make their way to offer support to Humboldt.